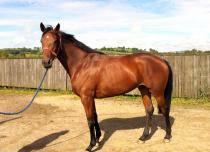 A nice active athletic mare, ready to go & trainer plans to run her in middle of February. High-Rise - Derby winner, won only 2yo start, from exceptional family, sire of winners in Japan. Saphire Night (GB) (2001 f. by Sir Harry Lewis (USA)): 3 wins over hurdles and £12,190 and placed 4 times and placed 3 times over fences, 2012. Badger (GB) (2000 g. by Classic Cliche (IRE)): winner over fences and £13,730 and placed 10 times; also 3 wins in point-to-points, 2010 and placed 9 times. Your Place Or Mine (IRE) (2002 f. by Classic Cliche (IRE)): winner of a N.H. Flat Race at 4 years, broodmare. Why Are You Asking (IRE) (2005 g. by Needle Gun (IRE)): placed 6 times over fences, 2012; also placed once in a point-to-point at 5 years, 2010. Kate's Legacy (IRE) (2011 f. by Scorpion (IRE)). 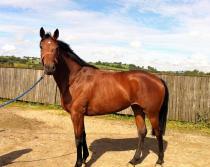 She also has a 2-y-o filly by Beneficial (GB). TALEGO (FR) (g. by Tyrant (USA)): 4 wins over jumps in France inc. Prix Congress Chase, Auteuil, L., Prix Andre Massena H. Hurdle, Auteuil, L. and Prix Orcada Steeplechase, Auteuil, L., placed 24 times inc. 2nd Prix Daniel Gillois Steeplechase, Auteuil, L., Prix La Perichole Steeplechase, Auteuil, L., 3rd Prix Duc d'Anjou Chase, Auteuil, L., Prix Ferdinand Dufaure Chase, Auteuil, L. and Prix Millionnaire II Steeplechase, Auteuil, L.
Tingaro (FR): winner over jumps in France and placed once. Tiraldo (FR): winner over jumps, 2nd Tote Placepot Worcester Novices' Chase, Worcester, Gr.2. Blanc C'Est Blanc (FR): 3 wins, £25,778: winner of a N.H. Flat Race at 6 years; also 2 wins over hurdles at 6 years and £18,725, placed 3rd K. McManus Bookmaker Joe Mac Nov.Hurdle, Tipperary, Gr.3. TARAGA (USA): 9 wins over jumps in France inc. Prix Georges Brinquant Steeplechase, Auteuil, L., placed 10 times. Tyquabella (FR): winner over jumps; dam of Tyquaveron (FR): winner over jumps at 4 years, 2011 in France and placed once. Tygala (FR): placed twice in France; also 3 wins over jumps in France and placed 6 times; dam of a winner.